Eagle feather from Old Abe, the mascot of the 8th Regiment of the Wisconsin Volunteer Infantry during the Civil War. Twelve-year-old Ida Karne picked up this feather when visiting Old Abe the War Eagle in 1868. 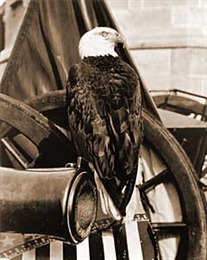 Today, it represents one of the few remaining parts of the eagle who became famous not only for his Civil War exploits, but also as a symbol of valor and freedom in the post-Civil War era. Born around 1861, the eaglet that would later be known as Old Abe was captured from his nest and traded by Ahgamahwegezhig (Chief Big Sky) of the Flambeau Band of the Ojibwe Indians to the McCann family of Chippewa County, Wisconsin. When President Abraham Lincoln called for troops in 1861 to fight the seceding Confederacy, the McCanns sold Abe to the Eau Claire militia for $2.50. The militia traveled to Madison, becoming part of the 8th Regiment of the Wisconsin Volunteer Infantry. Captain John E. Perkins named Old Abe named after the newly elected President Lincoln. After residing with the regiment during training at Camp Randall in Madison, Abe accompanied the regiment as it headed south. As the mascot of the 8th regiment, Abe saw action in 37 battles and skirmishes, including some of the bloodiest fighting at Vicksburg and Corinth. During encampment, Abe would perform for the troops with crowd-pleasing stunts and his celebrity grew with his morale raising flights over the troops. Old Abe's long life ended March 26, 1881 when he died from smoke inhalation during a fire near his home in the Capitol. His remains were mounted and for the next 20 years his body remained on display in the rotunda of the Capitol building. After construction of the new State Historical Society building in 1901, Old Abe was briefly housed at that facility before being moved back to the Capitol in 1903 by order of Governor LaFollette. Sadly, Old Abe's remains were destroyed when the Capitol building burned down on February 26, 1904. A photograph of Old Abe, the War Eagle, was taken by Wisconsin photographer H.H. Bennett and is one of the most enduring images of Old Abe.